Salad conquered with your man card securely in your pocket. You’re welcome, now go chop some wood! 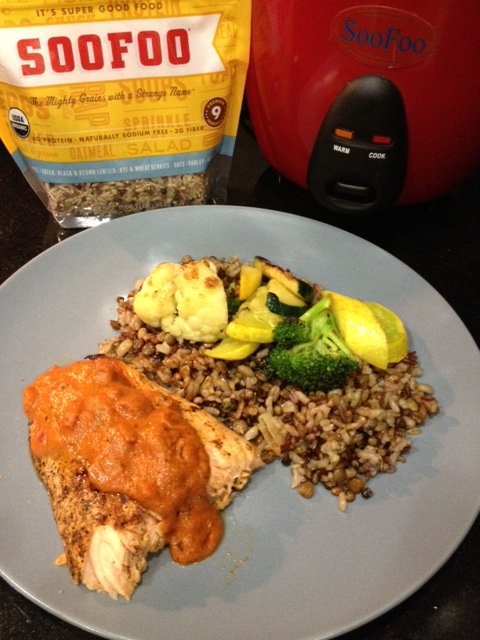 Pan seared salmon, dressed with creamy tomato vodka sauce, complimented by a seasoned blend of SooFoo’s whole grains, lentils, and brown rice, and sautéed vegetables. Sounds fancy, huh? Well, imagine having this delicious, nutritious, gourmet meal in less than 20 minutes, using no more than 2 pans. That’s it! It’s done. Plate and serve. You’ll feel like you just competed on an episode of The Food Network’s “Chopped”…and no way are you getting chopped with a dish this good! 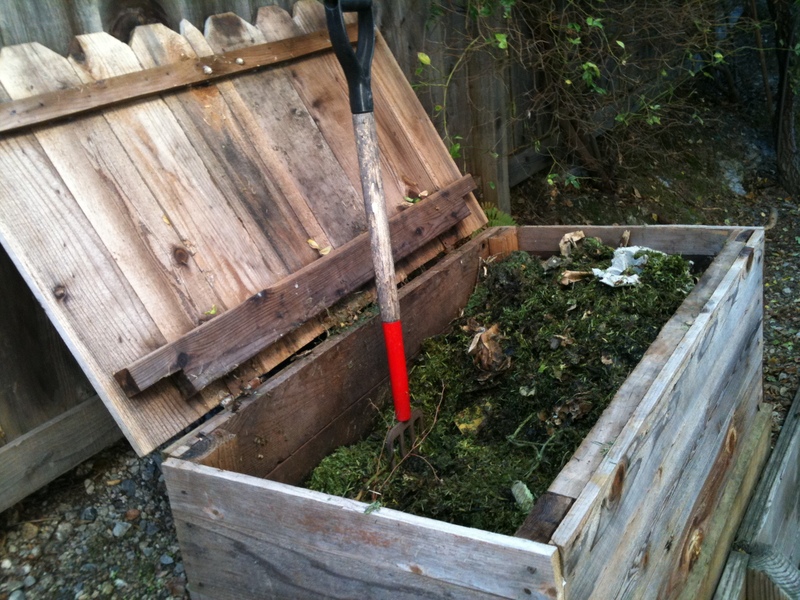 Seems like we’re all eating leftovers from Thanksgiving’s big meal! But by now you might be bored of turkey and looking for something a little different when watching football or your favorite holiday movie and/or something hearty but simple from a long day of shopping. 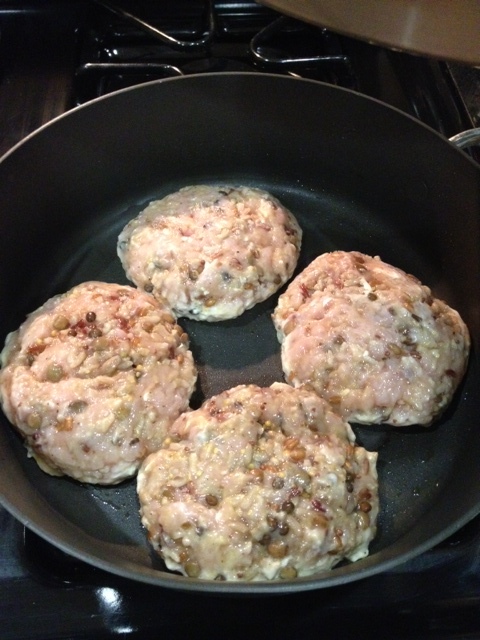 Why not make a turkey SooFoo burger? You can blend up some of your leftover turkey or get some ground turkey from your favorite supermarket. 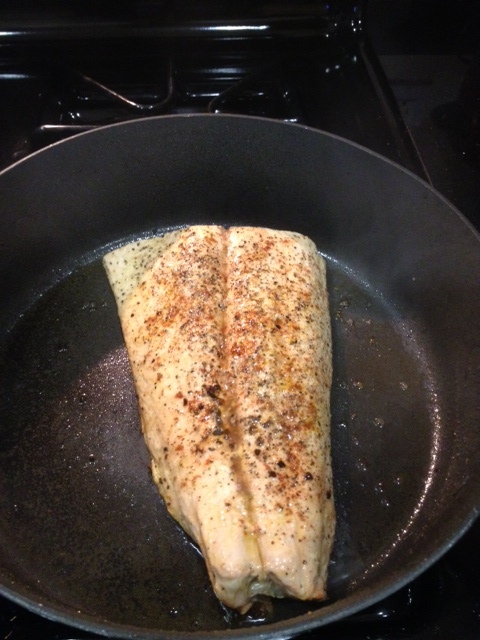 Cook in a pan on medium heat until browned on both sides and cooked through. Recommended to serve with avocado or sautéed mushrooms..mmm. 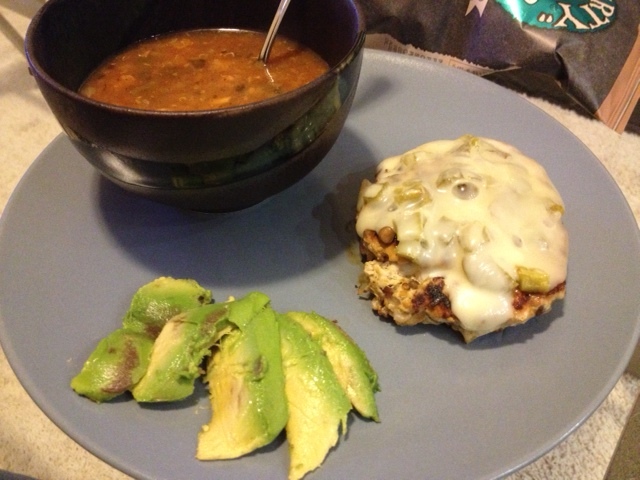 The SooFoo adds flavor and heartiness to make more like a beef burger. Good stuff! Are those chips on the side?…YEP. Don’t worry though, by skipping the bread, we could afford a few extra carbs. Just make sure you go with a healthier variety. Maybe try some lentil chips. SooFoo is having a Fall Recipe Contest. We’re looking for fall-inspired dishes that we would want to serve at Thanksgiving dinner. Recipes can be for an entree, a side dish, an appetizer, a dessert, a baked good or whatever recipe you can come up with. Recipes must contain SooFoo. Recipes will be judged on creativity, appearance and other factors so make sure the photo looks good and make it easy for us to follow along with. The winning recipe will win a $50 grocery gift card. If we get 10 or more valid entries we will also add two runners up who will each take home some SooFoo prizes. 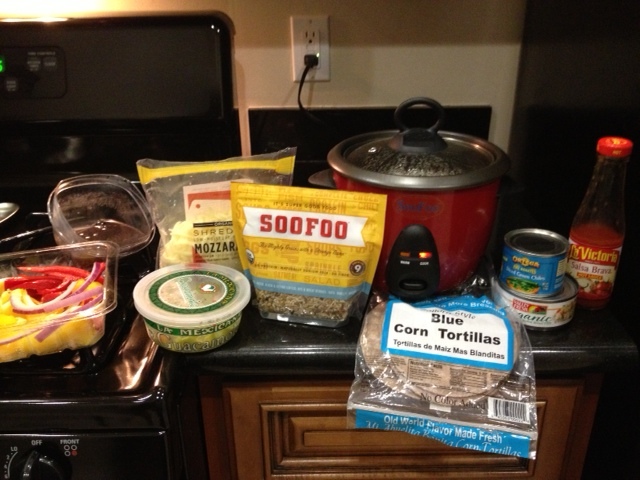 The winning recipe will also be featured on the recipe section of our new SooFoo Website! There are two ways to enter. 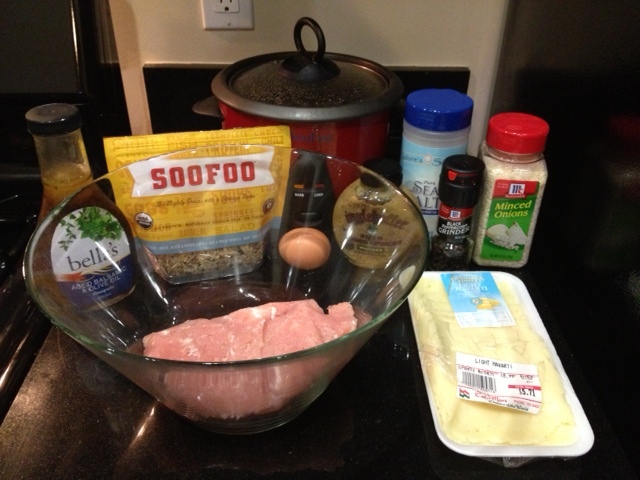 You can post your creation on our Facebook wall or you can E-mail your recipe to social@soofoo.com. 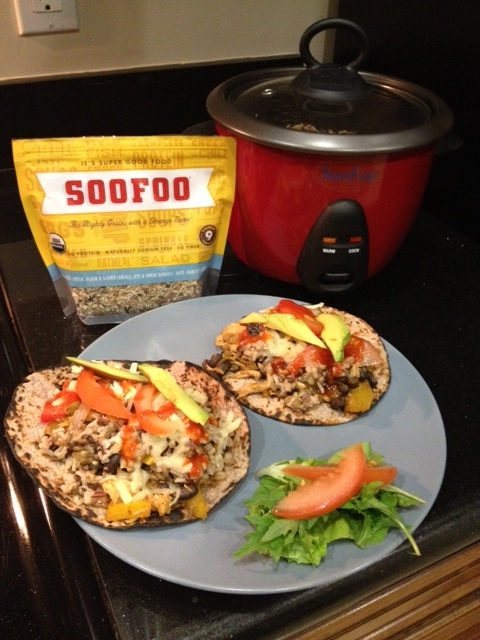 SooFoo is sold in many health food stores and select Whole Foods Markets. You can check for a retailer near you or it is also available to order on our website. You have until November 17th to enter, so Good Luck! Rules: Only unique recipes will be allowed. All recipes must include a recipe name, photo of the finished product, a list of ingredients with amounts and step-by-step preparation instructions and all recipes must include SooFoo in some form. We will accept entries until Saturday, November 17th at midnight PDT. By entering you allow SooFoo the right to use your recipe on it’s website, blog and social media sites. We will select a winner and if we get more than 10 entries, 2 runners up prizes. Grand Prize will be a $50 grocery gift card and any runners up prizes will either be a SooFoo Rice Cooker Prize pack or packages of SooFoo. This contest is not affiliated with Facebook. Which bowls should we use? 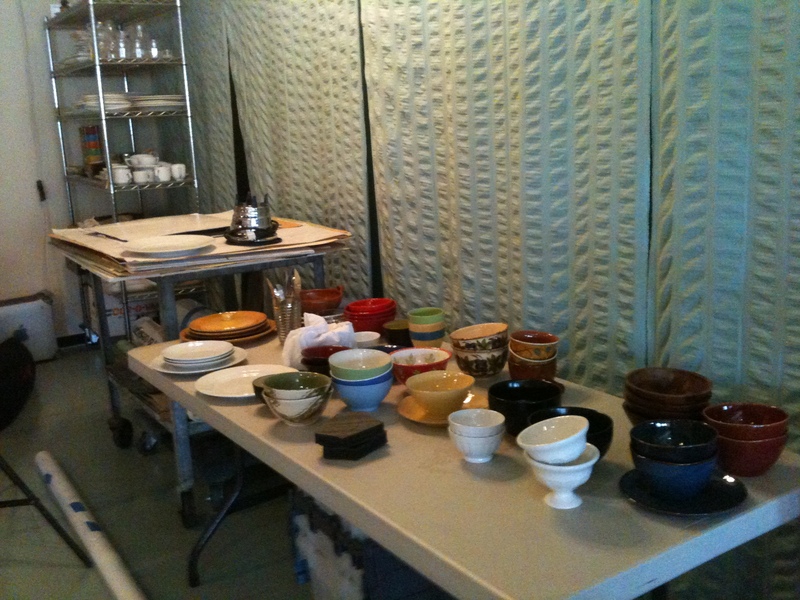 We went ahead and tested lots of different bowls. Different bowls showed off our many different usages of SooFoo so we ended up taking photos with many of these! 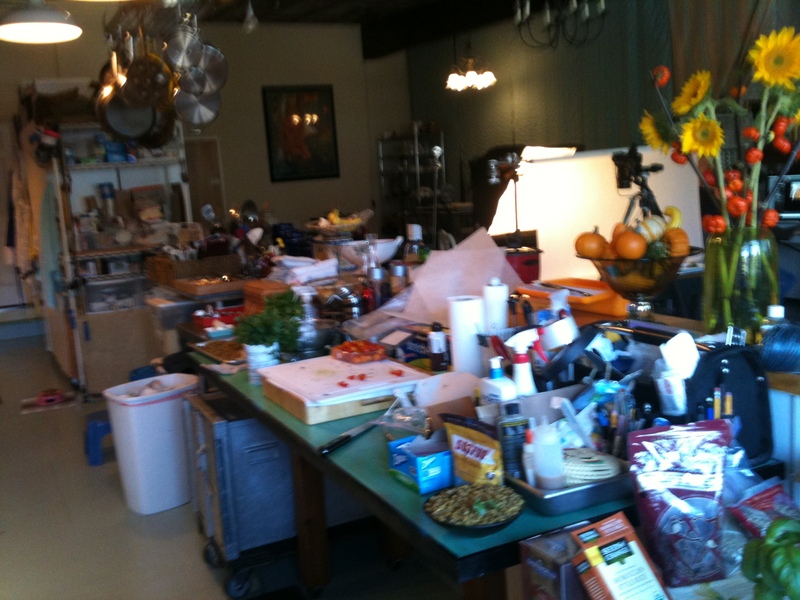 While the photo shoot itself was clean, behind the scenes in the SooFoo test kitchen we left quite the mess. 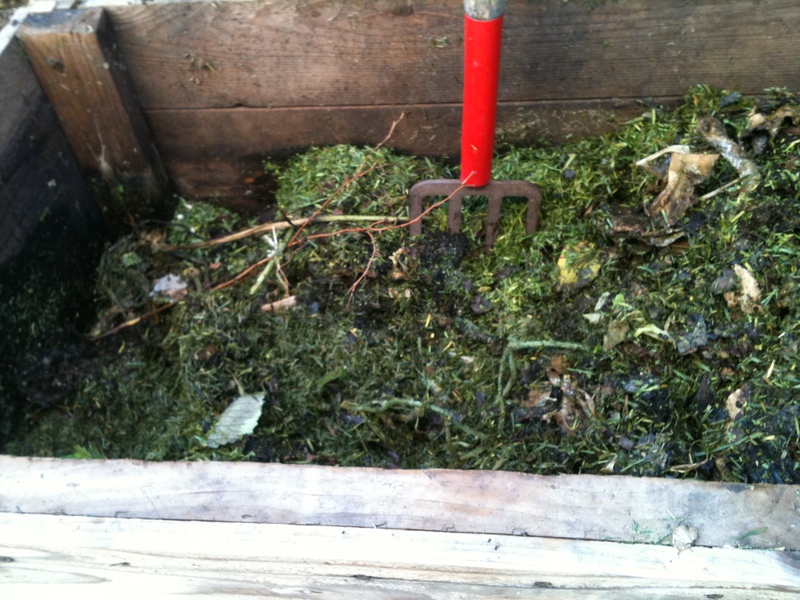 Lots of props, dishes, cleaners and of course freshly prepared SooFoo! Here’s one example of us getting SooFoo prepared for shooting. This is our original SooFoo prepared with only fresh parsley. Will this bowl make the cut? We can’t wait to share with you the results of a couple long days in the kitchen and studio and we’re excited about what the future holds. Until then, check out our new website to order SooFoo and see some of our wonderful new recipes! Last weekend we had to serve a meal to some vegans so we thought we’d try something all new! 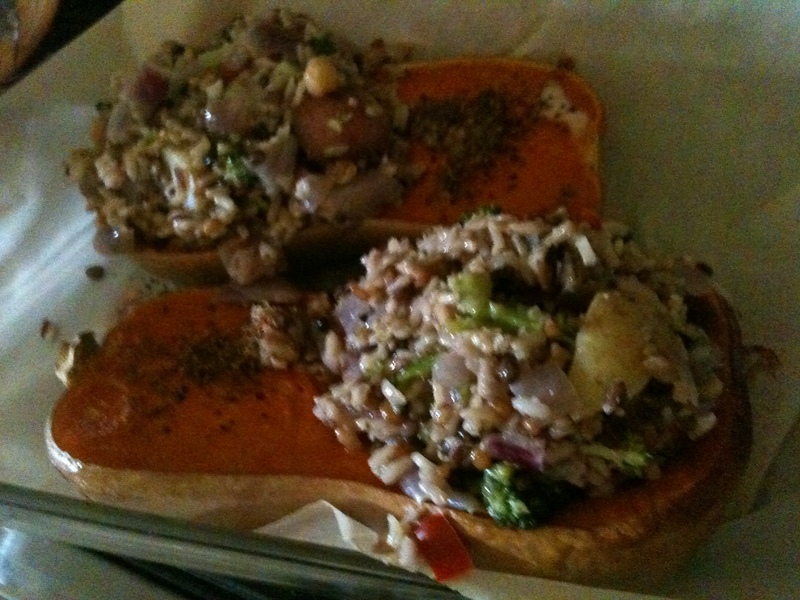 We decided on a SooFoo stuffed butternut squash since it is fall and we’ve always wanted to try it. We basically served this as the entree with a side green salad and baked apples stuffed with oatmeal and maple syrup for dessert. A healthy autumn dinner. We made these the morning of the dinner; we cut the squash in half, scooped out the seeds and baked for 45 minutes at 350F. In a bowl we combined cooked SooFoo (leftovers) with red onion, diced potatoes (leftovers), mixed veggies, garlic, and threw in some garbanzo beans. We then reheated for 30 minutes before dinner was served and they were excellent! 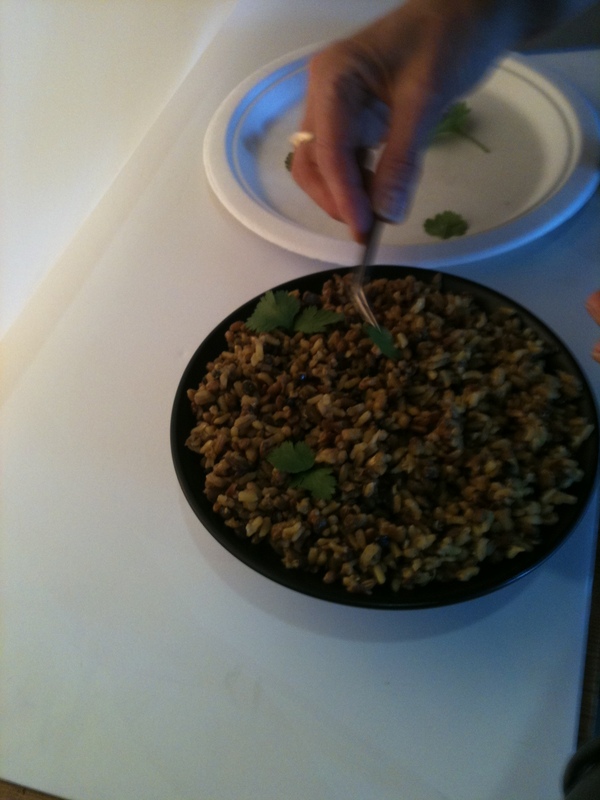 Not necessarily a real “recipe”- but the is beauty of SooFoo, you can combine it with anything and it tastes amazing! 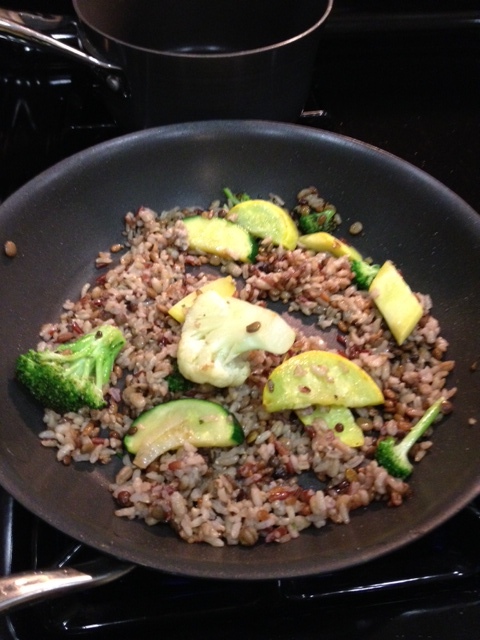 It is cold and drizzly in NorCal, yuck- but very inspirational for warm comfort-food cooking! Try this wonderful fall dish today!! !